Hey y'all! 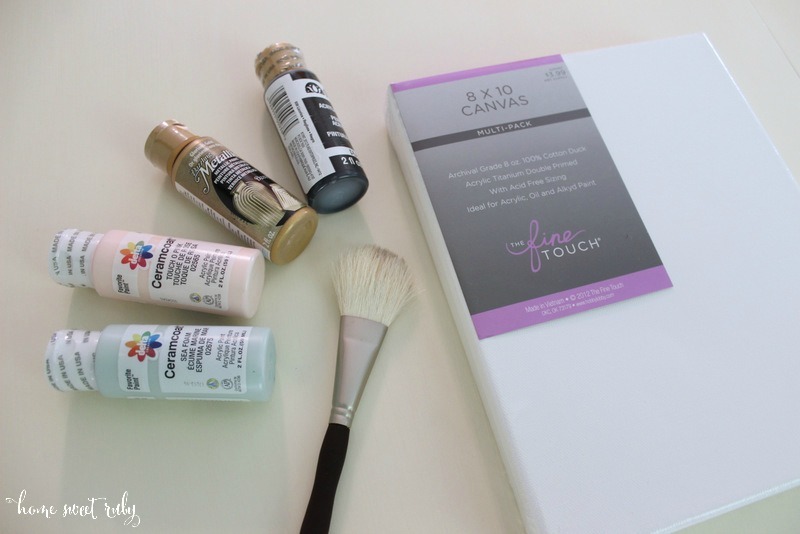 So if you follow me on Instagram I gave you a sneak peek at today's post... brushstroke art! I originally came across this idea on Pinterest which led me to Cuckoo 4 Design and Made By Girl's Cocoa & Hearts artwork. It's pretty gorgeous, you should definitely check out her work! Unfortunately all of her designs were sold out, so I thought I'd try my hand at a similar brushstroke painting. The bonus is you can decide which colors work for you, the downside is mine definitely doesn't look as pretty as the originals. Despite the simple nature of this project, I was being a total perfectionist and getting mad when the paint didn't go where I wanted it to go. Especially since that meant it was on my arms, face, and even my leg (What?!). I tried to learn from the blending skills I mastered in my last painting adventure, but since there were no pudding shots involved I think that made a big difference. 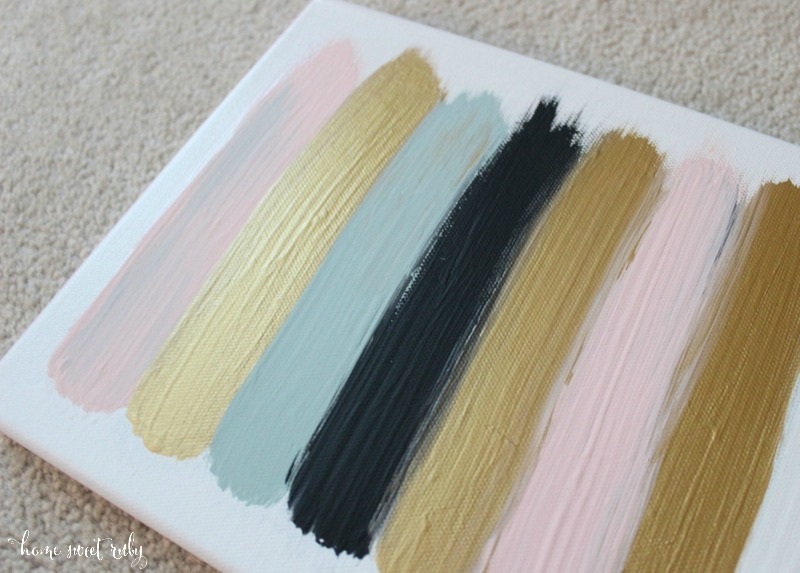 I want to put this in my home office once I put up the gallery wall so I printed off my color inspiration for the room and practiced the brushstrokes and colors on a piece of cardstock. I definitely recommend practicing a little just in case you screw up on your canvas and can't fix it. Obviously the next step is doing the same on your canvas, but hopefully better than I did. Instead of washing my brush with water in between colors, I just wiped a little bit off and dipped it in the next color. I left a little more white on one edge of the canvas which annoys the perfectionist side of me. My brush was also a little rogue at times and I had to touch up with white paint. Just make sure you get a decent brush no wider than 1 inch. And here it is with some of the other prints it will be joining on my gallery wall! I think the colors came out perfect! Isn't that metallic gold so pretty?! I have approximately one third of my desk painted so there will be more on the office redo soon! The problem with redoing a desk is that if you take more than one day on it, you end up working on the floor like I did on Monday. Edit: Here it is hung up on the gallery wall! I ended up redoing it with smaller brushstrokes, which I liked better. It's just trial and error really! 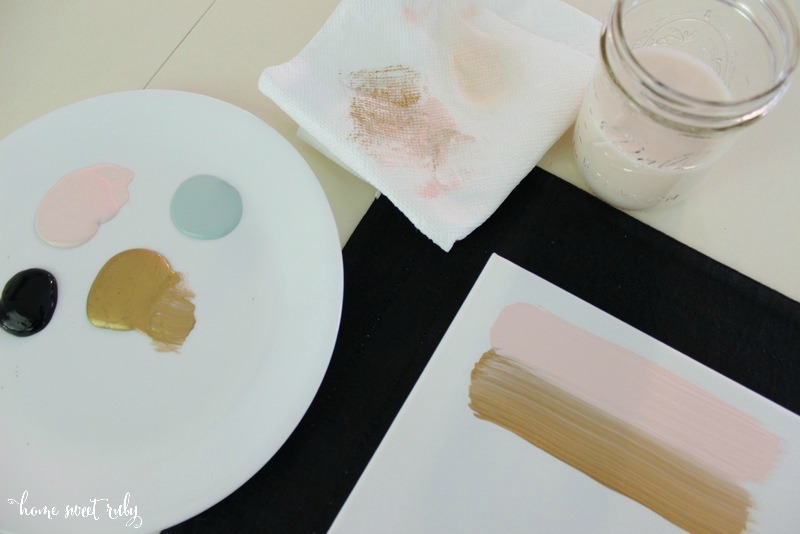 Anyone else feeling crafty enough to pull off this pretty project? You can see more photos of my home office redo here! Looks so good! 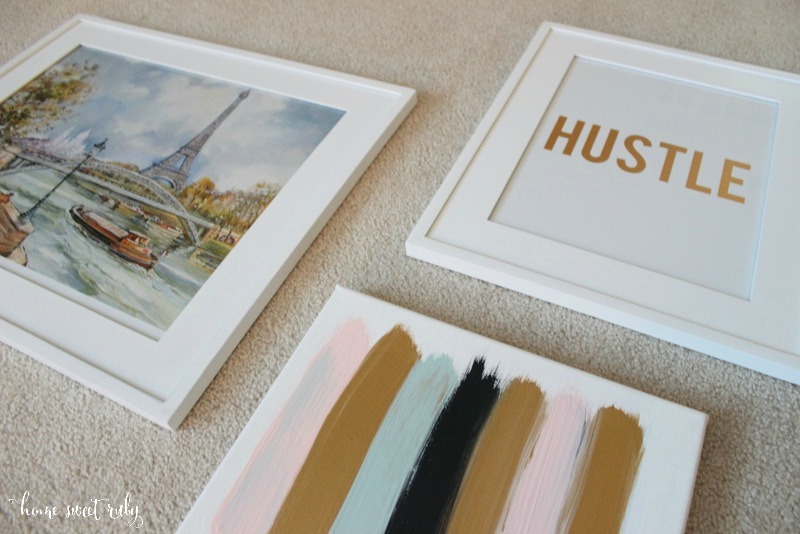 I've been wanting to do a painting like this for when we start decorating the nursery, you have inspired me!! 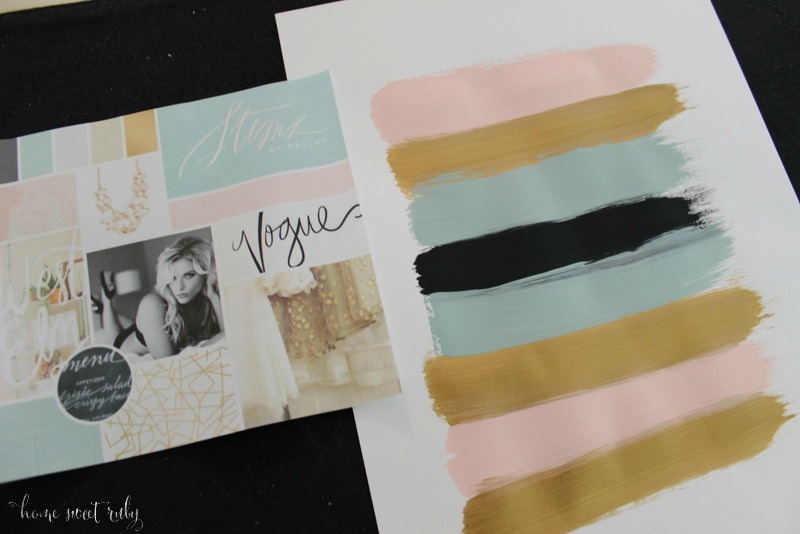 I just started my own side business planning events, and I am OBSESSED with brushstroke/watermarks like this! I am using similar looks for my brand...I totally need to make this for our pad. I love those colors together! SO pretty! This is beautiful! Can't wait to try my own! This is so cool! I will definitely have to try it! OBSESSED! And that color palette is perfection. So impressed!! I just love those colors together! I have been wanting to diy this! Thanks for the motivation. Yours is gorgeous! The canvas turned out great! Loving the color combo and gold makes everything better ha. I need to take an Etsy break and get back on the DIY train for sure. I love a quick update like this and the best part, when you're bored of it, just create another! Those colors are so gorgeous I would love to try this! Love those colors! So pretty! And I always end up with paint all over me when I'm painting. I don't know how it happens, but it's always everywhere! ooooh pretty! you're so fancy girly! So cute! I need to definitely start trying out some of these DIY projects :) Good job!! Cute! I am so not artsy and would not be able to recreate anything close to this, ha. I love the color way you chose for your office, can't wait to see the final reveal. Love this...gorgeous! And seriously I'm sure just a slight fraction of the cost of the ones you would have to buy! Looks awesome!!! I want to make one now too!! I love it and want that for my bedroom!!!!! What a fab idea! Also -- what are the blending skills you learned from last time?? LOVE this! So cute!! the colors you picked are perfect!